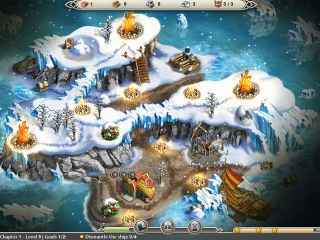 Free Download Viking Saga: New World Game or Get Full Unlimited Game Version! Plunge into new adventures of the Viking king and his friends. In order to get advantaged of playing Viking Saga: New World full unlimiteg game version you must register the game. Several years have passed since Ingolf became the king of Iceland. Since taking the throne, the king has married his beloved wife, Dalla, and welcomed two beautiful children into a growing and prosperous kingdom. But when a terrible disease begins to sweep over his lands, Ingolf must travel to the far west to find a cure that will save his family and his people! Join Ingolf on an unforgettable journey to the wondrous corners of the ancient world and meet new characters along the way in Viking Saga: New World!